Earlier today, Toyota launched the all-new second generation 2016 Toyota Fortuner at the Meydan Hotel in Dubai, UAE. Click below to watch out video introduction to the new 2016 Toyota Fortuner. 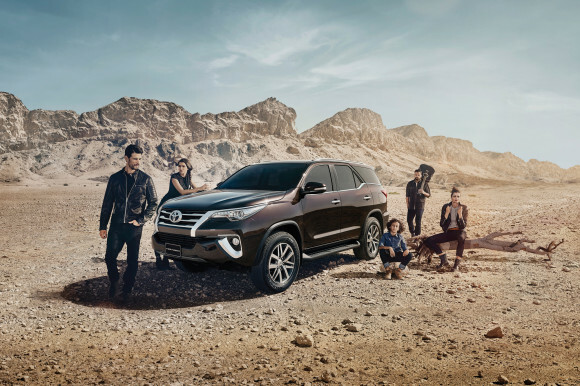 Toyota and UAE dealer Al Futtaim has announced the prices and spec for the new Fortuner: the 2.7 with 164bhp and 181 lb ft of torque is the entry-level model comes in EXR guise with a 6-speed auto, cruise control, knee airbags and ISOFIX child seat anchors for AED105,900 ($29k). The next one up is the 4.0-litre V6 with 235bhp and 277lb ft of torque, in GXR guise which comes with paddle shifts, smart entry, push button start and 7-inch centre monitor, all for AED127,900 ($35k). At the top of the range is the VXR with the same engine, plus powered tailgate, leather upholstery, 8-inch rear entertainment screens, all for AED139,900 ($38k). 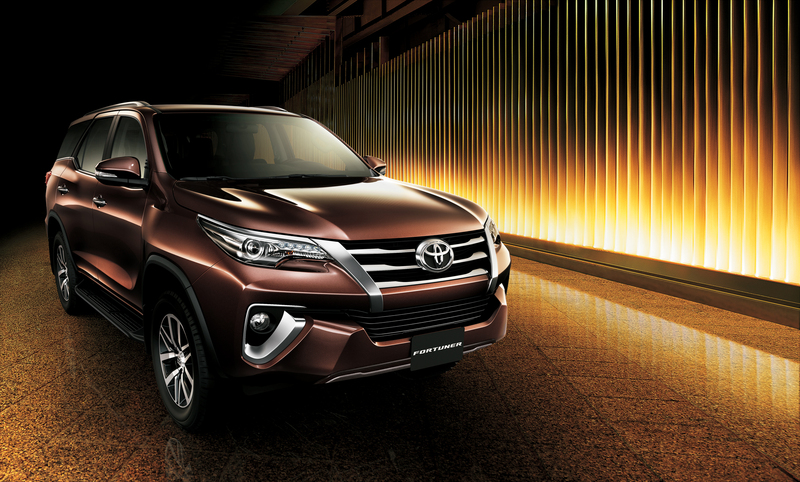 Although it’s a completely new car, and it’s longer, wider and lower than the out-going Fortuner, this is still based on the Hilux pick-up, albeit the all-new version of the truck. However it’s distinguished from the pick-up by its more sophisticated and car-like dashboard and interior, and the fact that it was coil spring rear suspension, rather than leaf springs. It’s a good looking thing, with strong exterior features, and the interior (particularly on the range-topping version I looked at) was comfy and appealing. There are three rows of seats inside (the last two fold up at the sides, and are really just for kids on short journeys). 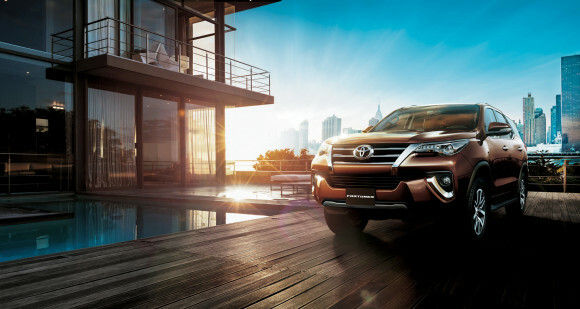 It does have part-time four-wheel drive with locking diffs and an ECO or ‘POWER’ mode for driving. All the usual safety features are present too. We hope to bring you a drive review of this soon! I purchased the new Toyota Fortuner in May 2016, from day one it has a slightly blowing exhaust. Despite having given the car to Al Badia Service Centre for one full day of tests, the problem remains unresolved. I am very frustrated about the whole issue, the Al Badia Service Centre Management have dealt with the matter in a very unprofessional manner. Currently, I have taken the matter to their Customer Relations Department based on Shaikh Zayed Road but I am not holding my breath on them finding a solution. I did call your team on Dubai 103.8 radio program and you suggested that I contact the Toyota Regional Office. I have tried searching the various Toyota and Al Futtaim websites, there are no contact details given for the Toyota MENA office ! Are you able to provide any assistance in this matter. I am looking for an independent assessment of the exhaust issue with the car, as I have lost all confidence in Al Futtaim Motors. We’ve passed on your comment to Toyota Middle East. Thanks. to the original OP in the comment section, and to the writer of this post, i seriously think that this car is over hyped and over rated, and way over priced i came to the conclusion after purchasing the 2017 VXR version supposedly top of the range with full option and was duped by the sales team starting with TOYOTA stopped having electric seats in the 2017 models, the VXR’s do not come with Downhill Assist Control (DAC) which at a latter stage i found out to be both just sales lines and they do exist in others. now we come to the problems you face after the fact you are driving it and on the road. 1- door handles front and rear: when you try closing the door on any of the 4 door panels you will have the surprise of getting a piece of the handle out of its place in your hand, issue was solved by toyota team by gluing (yes Gluing) them back on. 2- steering button for voice command: does not operate and no voice command can be given it just mutes the sound system. Service team response the fortuners are not equipped with this function. 3- navigation system: in numerous instances it takes the navigation about 5 – 10 seconds until it catches with direction so it tells you to turn right after the fact you have missed the turn. toyota service team response take a video of the instance so we would know what is wrong!! Map freezing is normal while driving, again toyota service response, take a video of it occurring. the system should also be equipped with a digital compass, and according to the manuals and online data should be in the center console between the speedometer and rpm under information) but unfortunately service reply was fortuners in the UAE does not have this option. 4 – sound system: the radio turns on and if i am lucky i will be able to utilize the functions without it being frozen at least once and or rebooting the whole system, service reply take a video when it happens. 5- the system is supposedly top of the line, but it has the most basic features, i think you are better of buying an aftermarket, it is not worth the extra you pay for it. i tried to find the model number anywhere to understand the basics of it, i couldnt find it anywhere or even on any of toyotas brochures. 6- back 3rd row seats: the velcro holding the seat on the right hand side is short and misaligned, every bump i go over the seat bounces down. 7- reverse camera: i have had cars with reverse camers to as far as i can remember and if it didnt have one i used to buy one, but the one in this fortuner is the darkest you will ever see, if it is bright outside you cant see what it is supposed to show you and if you are an enclosed garage (i.e dark ) you will not see properly what you are backing into. 8- Tyre sensors, although they are primitive and like most but not all cars it will not show pressure or position of low tyres, one of the sensors has not worked for the past one month or so and the light has been on since. unfortunately i couldnt take it to the service center yet. 9- Drivetrain or shaft: since day one i have been complaining about a shift shock second to first gears, and a jolt while stopped at the traffic light (not while coming to a stop, i would be literally stopped without any movement, a human reaction is check the rear view mirror to see if someone has bumped into you feeling). Service team reply that is a normal behavior of Fortuners. i dont know and i am not sure if it is just this one unit or many others are on the market, but definitely it is not worth the money, this fortunerr currently has 4000 Km. only, i am waiting until next service then planing an official complain to consumer protection.